I fixed a glitch in PyMongo last week, the result of a slapstick series of mishaps. It reminds me of the Three Mile Island nuclear accident, which inspired the "Normal Accidents" theory of failure in complex systems: one surprise leads to the next, to the next, to an outcome no one anticipated. "'NoneType' object is not callable"
I could reproduce the bug: Whenever I restarted Apache, the PyMongo connection pool's destructor logged "TypeError: NoneType object is not callable." # _thread_id_to_sock is a dict of sockets. During interpreter shutdown, None is somehow being called as a function. I'm no expert on Python's shutdown sequence, but I've never heard of a method being set to None. And yet, the only calls in this code are the "values" method and the "close" method. What gives? I put a "return" statement at the beginning of "__del__" and restarted Apache: the error disappeared. So I moved the "return" statement down a line, before "sock.close()". The next time I restarted Apache, I saw the error again. Notice the call to "list"? When I installed PyMongo with Python 3.2, the installer ran 2to3 on PyMongo's code, which automatically translates Python 2 syntax to Python 3. Why did 2to3 decide to wrap the "values" call in "list"? Well, in Python 2, "values" returns a copy, but in Python 3 it returns a dictionary view that's tied to the dict's underlying data. 2to3 worries that I might rely on the old, copying behavior, so in Python 3 it makes a copy of the values by calling "list". So it must be the call to "list" that raises the TypeError. Sure enough, when I deleted the "list" call from the installed PyMongo code, the exception disappears. Fantastic! Sure enough the error disappeared. I could import this module into the Python shell, then quit, and I got no TypeError. Actually I didn't see it print "del" either—the pool's destructor never runs at all. Why not? * before all modules are destroyed. But the interpreter is dying and it will never call "PyGC_Collect" again, so class C is never destroyed and neither is the pool. My little C program acts just like the application in the bug report! What is it about this code that makes it throw the TypeError during shutdown, when a regular Python interpreter does not? "PyImport_Cleanup" even clears the "builtins" module, which includes functions like "list". Any code that tries to call "list" afterward is actually calling None. Now "Py_Finalize" calls "PyGC_Collect". (It will then run "PyImport_Cleanup" for the second time, but that's not relevant now.) 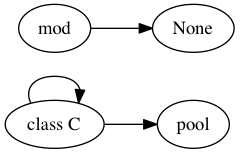 This is the difference between the regular interpreter's shutdown sequence and mod_wsgi's: In the mod_wsgi case, modules have been cleared before the final garbage collection, so class C is destroyed along with the pool. However, since the pool's destructor runs after "PyImport_Cleanup", its reference to "list" is now None, and it throws "TypeError: 'NoneType' object is not callable". Success! I had traced the cause of the bug from start to finish. To recap: in the bug-reporter's code, he had made a reference from a class to a pool, which made the pool's destructor run very late. And he ran the code in mod_wsgi, which clears modules before the final garbage collection, otherwise the pool's destructor wouldn't have run at all. He was using Python 3, so 2to3 had inserted a call to "list" in the pool's destructor, and since the destructor ran after all modules were cleared, the call to "list" failed. Now that I'm using "itervalues", 2to3 now replaces it with "values" in Python 3 instead of "list(values)". Since I'm no longer relying on the "list" builtin to be available in the destructor, no TypeError is raised.